Hello you lovely lot :) I'm back again with another fashion based post, I'm finding them alot more fun than I used too you know! With the sun creeping in and out of our lives at the moment it's a struggle to know what to wear from one day to the next which is a total pet peeve of mine! As soon as I see the sun and I'm not at work I love being able to head to my wardrobe and pick out something fun and colourful. I am LOVING kimono's at the moment, I'm not overly confident with my body just right now so I find them so comfortable. The 'mom' jeans are a pair I got in the sale a few months ago and I have really been enjoying owning and wearing something that isn't 'skinny' styled. Also how gorgeous is this necklace? 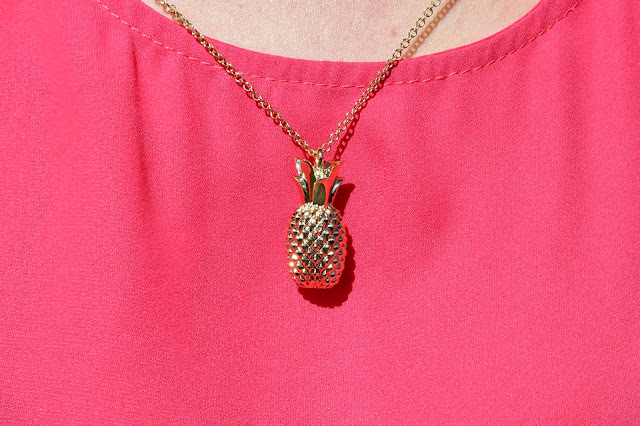 The lovely people at Jewel Street contacted me a little while ago about their site and after spending hours browsing through everything I decided to go for this cute pineapple pendant from Florelli and I'm so pleased with it. I'm a big fan of gold and I know I'm going to be wearing this alot over the Summer, it's a great length too which is always good. I've been wearing it alot with my roll neck top aswell and it goes so well! Needless to say, the case belonging to the what to get lacks realistic option. rolex replica It's really a verdict which can be more desirable allowed to remain to the vendor depending on selection in designer, rate, figure, besides other reasons. fake rolex It's a effective can it a lot of Cartier's alot more well-known units. replica chanel Roadster: That Roadster sections premiered on 2001 to be a throwback to the sporting trucks belonging to the 1950s and even nineteen sixties. fake cartier First-class an important racy start looking through lustrous figure, very nearly so much ast you can imagine belonging to the polished truck. fake hublot That Roadster figure is like that stunning Tortue mannequin and a lot more cost effective, being ranked the more cost-effective Cartier running watches for females. Loving the outfit hun, especially the kimono!